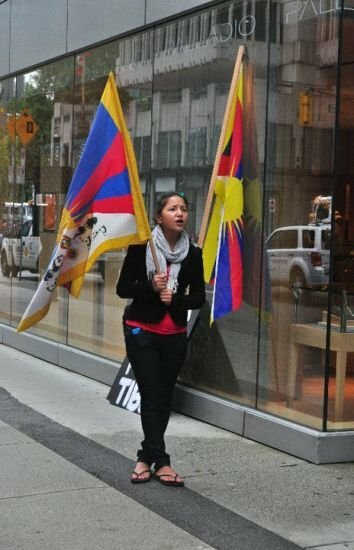 As the security clampdown in Chinese Provinces remains strong, Tibetan protesters continue to openly manifest their position. Tibetan protesters have pulled down a Chinese flag, put up posters calling for freedom, and shouted slogans at police in western China, defying a security clampdown following a spate of deadly protests against Beijing’s rule, sources in Tibet and in exile said Tuesday. More than a dozen Tibetans were also detained this week, adding to more than 100 who were picked up immediately following bloody protests two weeks ago that left up to six people dead, according to activists. On Saturday, Tibetans in Wonpo town, in Sershul county in Sichuan province’s Kardze (in Chinese, Ganzi) prefecture, pulled down the Chinese national flag from a school, according to a Tibetan living in India, Champa Yonten. A day later, Chinese police detained four Tibetans after they shouted slogans in front of a police station in the Khangmar village of Dzatoe county in Qinghai province’s Yulshul (in Chinese, Yushu) prefecture, a second India-based source said, citing contacts in Dzatoe. Jigdra Tenzin identified the men as Tsering Palden, Tsering Sangpo, Tsering Tashi, and Dorjee—all believed to be in their 20s or 30s. He added that Chinese forces had set up checkpoints and tightened security across Dzatoe and in nearby Kyegudo. Champa Yonten, citing contacts in the region, also said that on Saturday, “leaflets calling for freedom for Tibet and for the return of [exiled spiritual leader] the Dalai Lama appeared around Wonpo town." Meanwhile, also in Kardze, leaflets and posters calling for freedom for Tibet appeared on Sunday across nearby Dege county, a Tibetan resident said, speaking on condition of anonymity. “In some cases, slogans were even painted on walls and on boulders in the area,” the source said. Two monks and about a dozen villagers have been detained in Dzamthang (in Chinese, Rangtang) county, a Tibetan resident in the area said. "They [The monks] were innocent, but they were taken away in the night." He said those detained were beaten and locked up at the Dzamthang county detention center. Tensions have risen in Sichuan province since three Tibetans set themselves on fire in Serthar (in Chinese, Seda) county, the latest in a series of self-immolations against Chinese rule, according to sources. Serthar and Dzamthang were among counties in Sichuan province where Tibetans protested against Chinese rule two weeks ago in which rights and exile groups believe at least six were killed and 60 injured, some critically. Another county involved in the protests was Draggo (in Chinese, Luhuo). Many of those who took part in the protests in Dzamthang, including many who were injured, were now in hiding at home, afraid to leave the house to seek medical attention for fear of further reprisals, the Tibetan resident said. An officer who answered the phone at the Dzamthang county police department hung up when asked about reports from exile sources that many Tibetans were being detained. An official who answered the phone at the police department in Kardze's Ngaba county declined to comment. "I don't know about this," he said. Meanwhile, foreign tourists have now been banned from all Tibetan regions until further notice, according to travel industry sources. "We were notified today that...no-one is allowed to go to any of the Tibetan districts," said an employee who answered the phone at a travel agency based in Chengdu, the Sichuan provincial capital. "Normally visitors from Hong Kong, Taiwan, Macau and overseas are allowed to go there in...tour groups," she said. A second travel agent confirmed the directive. "Apart from [the popular beauty spot of] Jiuzhaigou, visitors from Taiwan, Hong Kong and Macau and overseas aren't allowed to go [to Tibetan areas]," he said. An official who answered the phone at the Chengdu municipal government tourism bureau said the order had been issued ahead of the "sensitive" March anniversary of a major crackdown in Tibet in 2008. Lhasa, capital of the Tibet region, was hit by riots against Chinese rule in March 2008 that spread to neighbouring Tibetan-inhabited areas. Chinese authorities have ramped up security across Tibetan areas—from Lhasa, capital of the Tibet Autonomous Region, to the Amdo and Kham region —following the protests, according to sources. Telephone and other communication links to the protest areas have mostly been cut. Reported by Tenzin Wangyal and Norbu Damdul for RFA’s Kham Tibetan service, Hai Nan for RFA's Cantonese service and Qiao Long for the Mandarin service. Translations by Dorjee Damdul and Luisetta Mudie. Written in English by Richard Finney and Luisetta Mudie.